Ceiling fans seem to many of us like an old-fashioned method of cooling a room down; we often disregard them, thinking that they’ve been superseded by air-conditioning units, which really get the job done. However, there’s still a lot of love out there for the ceiling fan and you need to get onboard that particular train; here’s why. On their own, ceiling fans aren’t as good as your air-con; there’s no doubt about that. Teamed up with your air-con, however, they can reduce your energy usage by up to 40%. 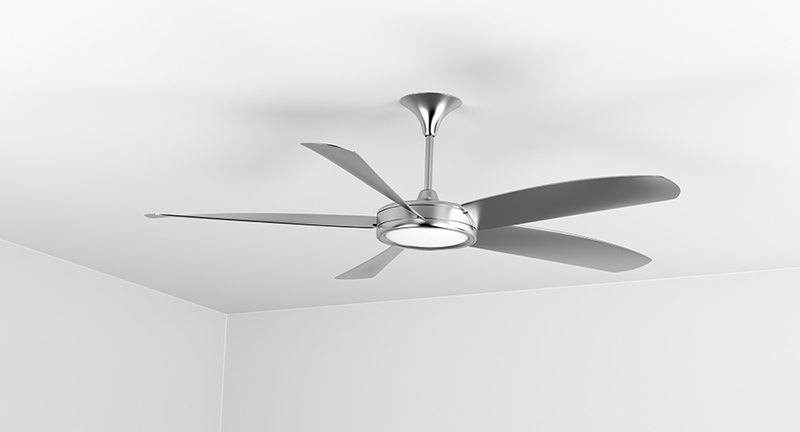 Your ceiling fan uses around the same amount of power as a 60W bulb, whereas your air-con is somewhere nearer 2,000W. Raise the temperature of your air-con and spark up the fan and they’ll work in tandem to provide cooling – but cheaply. When it’s a bit chillier in the evenings, you can change the blade direction of some fans so that warm air is pushed back downwards – to you. Warm air rises, as we know, but it doesn’t do you much good floating around the ceiling, so bring it back down where it belongs and save around 10% on your heating. With an air-con unit, you can find that some corners of rooms can be too cool for comfort while other corners are still humid and muggy. Ceiling fans, on the other hand, generate a gentle breeze that’s predictable and reliable. If you team up your fan with your air-con unit then you can turn the air-con up a few degrees so you’re not alternatively shivering and sweating. Many of us find ourselves struggling to concentrate or sleep with an air-con unit buzzing, humming or even rattling away constantly. Ceiling fans are really quiet, especially if it has timber blades, so you can study, relax and sleep under a cooling, silent breeze.